We drove up to Vermont this past week. Our route took us through rolling foothills splattered with the colors of a postcard’s autumn countryside. When we exited the highway we took a side street that ran parallel to a stream: a wide, shallow yet babbling mountain river that wove its way through trees and into the valley, beyond where I could see. I’ve had trouble reading my Bible lately. I’m inspired by stories of men and women who’ve gone before me, whose devotional lives were stapled in place by text, as if it were as comforting and reassuring as their favorite novel or sitting down for a cup of tea with an old friend. I want that kind of faith but lately it hurts a bit too much. It started as I was writing a note to friend who’d just lost a loved one to cancer. And I had a migraine. And with pain in my head and pain on the receiving end of my words, I wasn’t sure what I could possibly say. I figured the Psalms might be the cure. But they weren’t. I read them; I tried. I knocked but there wasn’t an answer; the door creaked open but the cabin was empty and the light in the fireplace slowly dying. They weren’t alive this time; they weren’t streams of living water flowing into my quenched and yearning soul. They were just words, words like Band-Aids for a gushing artery. But when I looked out my car window at the river twisting its way through the valley, I felt a twinge of something I might call “hope.” For the river carried change. And change is something I can relate too, something I can see. Change is what I feel when a migraine hammers away at the inside of my skull, when a cancerous growth steals life from someone who was once standing, breathing, talking, loving and loved. “It’s not that hard,” they told me. I pray for the grace to handle these sentiments, to see the heart behind them. But (it seems to me) that they take no account of pain, cancer, death, rivers and valleys. They take no account of life, so I can no longer take account of them beyond a soft nod and an immediate effort to shift the conversation. But, at the same time, we should not pay much heed to our doubts, the theologian Karl Barth once said. And I have to think he wrote this it while sitting by a river. Because with change the river also carries constancy. For rivers, as Wendell Berry notes, leave marks but bear none, though the rocks, shorelines and fallen trees penetrate and cut into them at every opportunity. And as it flows the river licks and soothes the rocks as it passes over them. It is always moving, always departing, and yet always remains. And every moment gives birth to the next. And, like rivers, faith carries me and lifts me even when I wish to remain untouched, to depart from its path and remain on the banks of my doubts and pain, watching as the waters move past. Faith may run dry, it may overflow, but it always is: always changing, moving and flowing, even if it’s just a trickle, a dry riverbed or a fossil testifying that the waters were there years ago but have since shifted its course. Either way, the river is still there, somewhere, though maybe beyond what I can still see. Faith is there: flowing, changing, staying, like rivers through the heart of everything that I am and could hope to be. 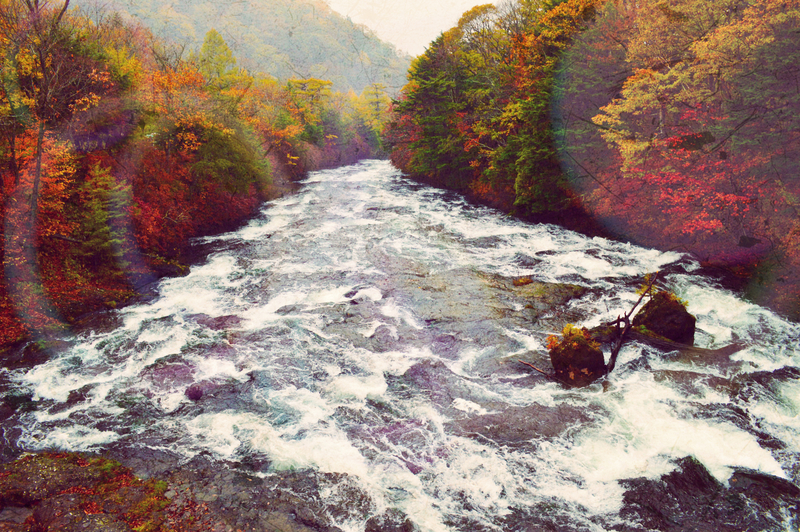 And as we drove along its bank I found solace in the view of a river out my window. For the river carries me, beyond the mountains, down the valley, weaving it’s way through the foothills into the setting sun. All things merge into one eventually, Norman Maclean wrote. And for a moment from the window of the car, as my eyes followed the river carrying me in its fold, I could feel every part of me merging with that One. And faith trickled into its center, babbling over stones of time and cutting its way through canyons of pain and pleasure, plains of doubt, valleys of wondrous assurance. Faith was always there, like rivers through the heart. I think this is one of my all time favorites.